At least five people have been rushed to the hospital following a jail brawl at Cook County Jail Friday afternoon. 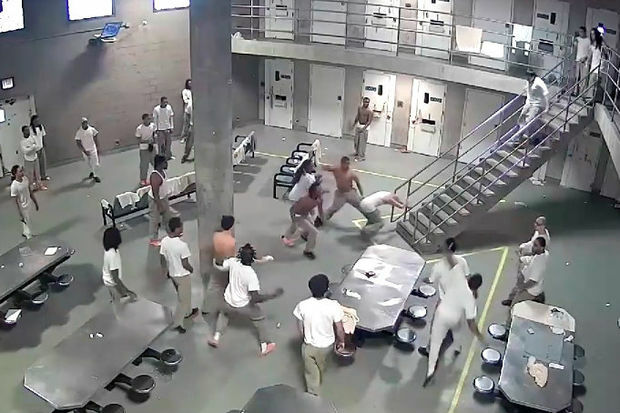 LITTLE VILLAGE — A video released Friday night shows the chaotic brawl at Cook County Jail that sent five inmates to the hospital. At about 1:30 p.m. Friday, a fight broke out among detainees housed in Division 9, the jail's super-maximum security division, according to the Cook County Sheriff's office. Ambulances were called to the scene at the jail for reports of multiple stab wounds. Paramedics transported five victims who were believed to be seriously injured to area hospitals, a law enforcement source confirmed. The injuries included puncture wounds, said Sophia Ansari, a sheriff's office spokesperson. While the sheriff's office continues to investigate what started the fights and the weapons used in them, the newly released 1½-minute video shows the melee unfold. About two dozen inmates were in the block's common area when one man stabs another man on the block's steps, the video shows. Following the initial stabbing, a fight breaks out, with inmates throwing punches and stabbing other inmates. Five seconds into the video, one inmate punches another inmate into a concrete column. As he lays there seemingly unconscious, another inmate kicks him in the head. Seventy seconds into the video, correctional officers storm the room, taking control of the scene. The fight was quickly under control by sheriff's deputies, Ansari said. Four of the injured inmates are in Cook County Jail charged with murder and one is charged with armed robbery. The division is secure and no staff were injured, Ansari said. The stabbings follows a hostage standoff and stabbing in June at the jail and an October brawl at the jail that sent 10 people — including two correctional officers — to the hospital.